Stop signs were part of the LTAP study. The safety and operational impacts of traffic signs can now be found in one publication recently produced by the Iowa Local Technical Assistance Program (LTAP) located at Iowa State University’s Institute for Transportation. The Sign Effectiveness Guide is a compilation and critical review of 48 research documents focusing on potential impacts of 11 static or enhanced signs commonly used by local jurisdictions. David Veneziano, LTAP safety circuit rider, and Keith Knapp, Iowa LTAP director, led the research. They said transportation professionals can use the guide, along with the MUTCD (Manual on Uniform Traffic Control Devices), to better understand whether a particular sign can be expected to impact safety or operations. It also can help agencies to better manage their signing budgets. The researchers collected and reviewed information on sign effectiveness, including the purpose of each sign; relevant information from the MUTCD; potential safety, operational, and behavioral impacts identified by past research; and alternatives to signage, such as increased enforcement or pavement markings. 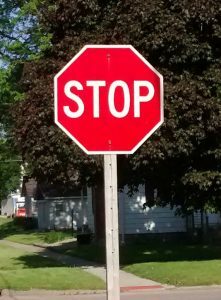 Some of the signs studied in the research were Stop, Yield, Speed Limit, Playground, Children at Play, Ice Warning, Deer Crossing, and enhanced signs, such as a Stop sign equipped with a flashing beacon. The researchers also looked at some warning systems, including Prepare To Stop When Flashing signs and horizontal alignment signs, such as curve warning, chevrons, and advisory speed plaques. They assigned reliability ratings of Low, Medium, or High to the research results, focusing on the potential safety or operational impacts of the signs and warning systems. Thirty-three of the results were rated Medium or High. Veneziano said that in addition to their safety and operational effects, signs produce other driver behavioral changes and impacts that are not as easy to measure. The Iowa Highway Research Board and the Iowa Department of Transportation funded the study.